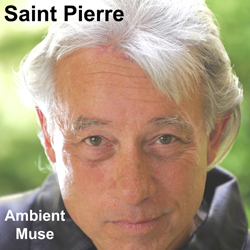 SAINT PIERRE: Presenting all- encompassing guitar instrumental melodies of music intended to transform into a creative atmosphere of peace & quiet. The arrangements turn over in the mind; while medatatively & reflectively becoming absorbed in thought. Ambient Muse genre of music is designed with an emphasis on tones, atmosphere, creative musical structure, and rhythms. It accommodates many levels of listening attention without enforcing one in particular. These arrangements are as ignorable as they are interesting. ALL PROCEEDS GO TO HELP THE KIDS. 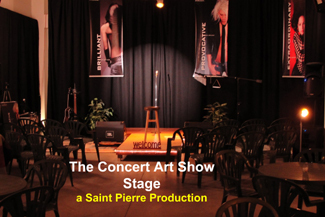 Saint Pierre has designed sounds, basically combining a number of cultural moods. It is an open style, with influences from many other genres. The music neutralizes the street noises which can indiscreetly enter into the play of conversations. He creates multi-layered and dynamic pieces whose guitar textures weave into the randomness of his compositional structures. His intention is to "brighten" the environment by adding stimulus to it; to produce calm and a space to think. The Album "Ambient Muse" stimulates relaxation, contemplation, and inspiration utilizing 3 featured Martin Guitars: six string model D-35, twelve string grande bout model J-40-12, and four string acoustic bass model BC16-GTE. The compositions are quite lengthy, and much longer than popular commercial forms of music. The album is highly experimental, oriented with an impact that rises beyond nations and colors. His approach has manifested the Latin term "ambire", which is to surround. The recording studio has allowed him to become a painter with sound, which is really what he does in the studio, making pictures with sound... Enjoy. MusicAndArtForYouth.org, Helping Needy Kid Artists 9- 19 years old by providing FREE Student Scholarships: "One Kid At A Time". We are proud to present this entertaining service to the community! Amazing arts and inspiration, including a "ONE OF A KIND" experience that you will remember for a life time. It's one of the best in Ventura. Music And Art For Youth strives for purposeful opportunities to make the world a better place to live. We offer ways to make an investment in our next younger generation. Thank you for "Helping The Kids". Hope you enjoyed the Mount Fuji, Japan: Full Syncronized Artistic Fireworks Creation.